The no-frills app let users swiftly write down notes, compile lists and jot down ideas, with growing collections of notes organised with tags and pins. 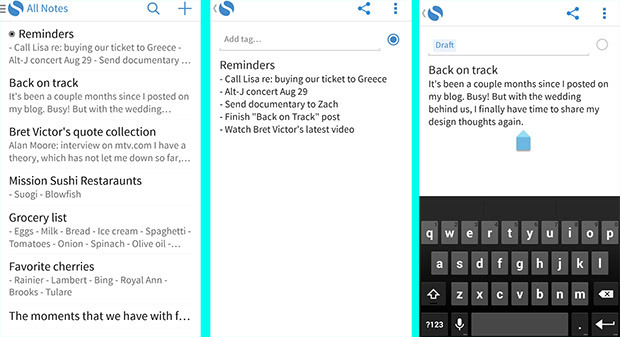 The problem was that Simplenote never troubled themselves to make an Android or Windows app, so accessing the cloud-based notes involved using third party Android apps like Flick Note and a desktop client called ResophNotes. When it worked, it worked supremely well. Notes written on the desktop client instantly synced with the FlickNotes app, and content could be accessed via any browser on the Simplenote site. But then the wheels fell firmly off the Simplenote wagon with the service being plagued by all sorts of troubling syncing issues, while the developer of FlickNote seemed to have left the building for good. There were a few alternative Simplenote-syncing apps available on Android, but these either looked like something out of 2006, came burdened with unremoveable adverts or insisted on using eye-searing white text on a black background. So, like many others, we abandoned SimpleNote and found other list/note taking apps, namely the all powerful Evernote and the superslick Google Keep. Although we think it’s unlikely that this new app will replace Google Keep – a free program which has developed into a quite exceptional note taking app – we may find ourselves coming back to Simplenote for longer notes. There’s no denying that Evernote is a mighty powerful beast, all those features can prove a bit overwhelming at times and we’ve missed the sheer simplicity of Simplenote. So we’re going to give this new app a go and see how we get on with it. If you fancy having a go too, you can download it from Google Play and the Amazon Appstore. 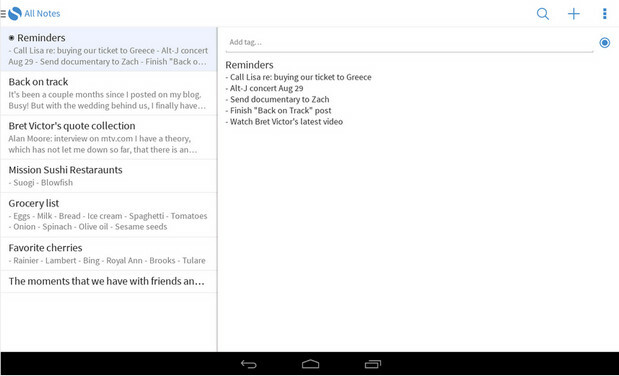 The nice thing about SimpleNote is it allows us to synced notes from iPhone to any gadget like Android or Kindle. Also, because they’re keeping their interface simple and clutter-free, it loads faster compared to other note-taking apps in the market today.